This is a report based on an elementary school Science Fair project to understand the feeding behavior and host preference of the Bagrada bug. We all know that Bagrada bugs prefer cruciferous hosts and can feed on a variety of other hosts. 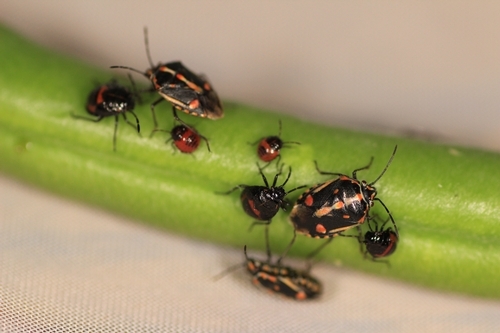 A small study was conducted to compare the preference of Bagrada bug adults and nymphs for five host plants from Brassicaceae, Fabaceae and Solanaceae families. Ornamental, crop, and weed hosts used in the study. Field-collected Bagrada bugs were maintained in the laboratory on broccoli and wild mustard. Sprigs of alyssum, florets of broccoli, freshly cut green beans, cubes of tomato, and sprigs of wild mustard each were placed in five different chambers of the feeding arena and covered with perforated lids. Fifteen adult or 2nd to 3rd instar nymphs of Bagrada bugs, which have been starved for 24 or 48 hours, were placed in the central chamber. 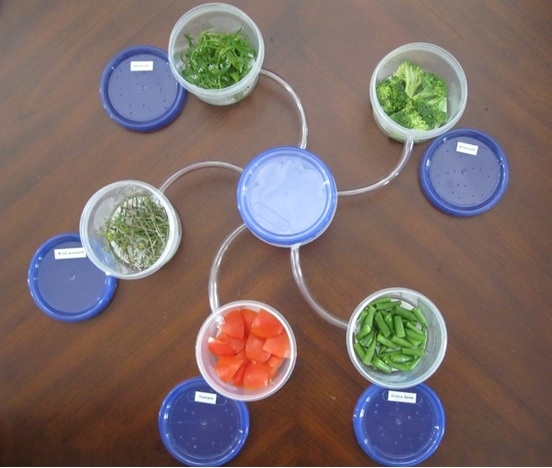 Insects were allowed to choose different food sources based on olfactory stimuli. Number of bugs in different cups was periodically monitored for 24 hours. The experiment with adults was repeated three times. Bagrada bug adults showed similar preference, on average, for alyssum, broccoli, and wild mustard followed by green beans. Nymphs showed a higher preference for green beans followed by alyssum. Starving the adults for 24 or 48 hours did not seem to have any effect on their food choices. Even after 24-48 hours of starvation, several insects did not seek food. Although Bagrada bugs were known to feed on solanaceous hosts like green peppers and eggplant to some extent, they did not prefer another solanaceous host, tomato when other choices were offered. Tomatoes do not seem to be at risk of this pest. They could probably be used in crop rotation. A strong preference of Bagrada bugs for green beans has not been reported earlier. Although complete life cycle is not studied on this host, preference in the presence of normally favored Brassicaceae hosts is important to note. Alyssum and wild mustard could probably be used as trap crops.